The Language Policy Service works to achieve a full linguistic equality in the university area, that is why we collaborate through financial grants in the implementation of activities to promote the Valencian aimed to the university community and that contribute to boost the use of Valencian at the Universitat de València. Both the promotion campaigns of the use of the own language and the academic and cultural activities developed fully in Valencian such as sessions, concerts, teatre performances, film screenings, distribution of publicatios, audiovisual or multimedia materials, etc are granted. Natural persons or legal persons whether or ont they belong to the university community and the student or professional collectives activities of whom have incidence in the university community. 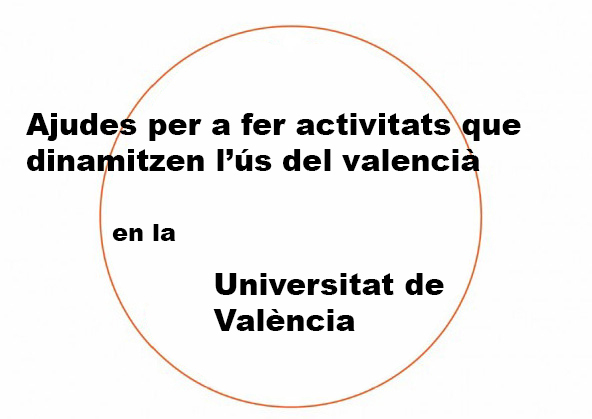 Organise activities that contribute to boost the use of Valencian in the Universitat de València during the 2017 year. Until the 30th November 2017 and at least 7 days before starting the activity which request help. The quantity awarded to each applicatio form will be determined by the Language Policy Service according to the evaluate of the report and the project presented, the viability and the interest of the activities with a maximum amount of 2,500€.